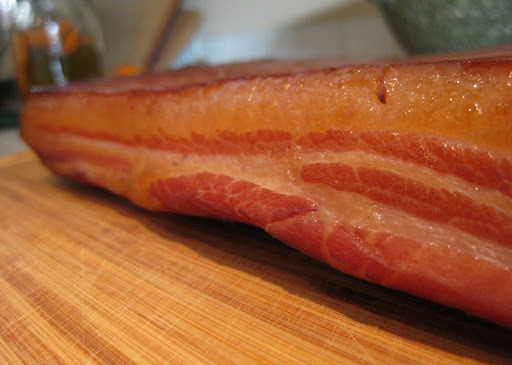 It is hard to believe that it has been almost two years now since we first posted on making bacon. That batch was our first, and it was so good that I ended the post by declaring: "we won't be buying bacon again". And we haven't! 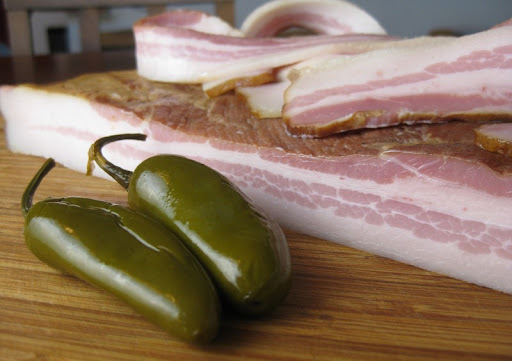 A fun variant on traditional bacon that we've been playing with recently is adding jalapeños to the brining stage. We've been known to enjoy a bit of heat on occasion, so we figured why not add some spice to our homemade bacon? But it ended up not doing much. What worked better was using canned jalapeños (you know, the kind that always come with carrot slices). It took a much larger quantity than we expected to get the desired effect, and over the course of multiple batches we noticed that a fattier belly carried the flavor much better than leaner meat. This is the same batch pictured at the top of this post. Once it cools and you cut into it, you get that characteristic bacon look. You can use this bacon pretty much as you would any other. 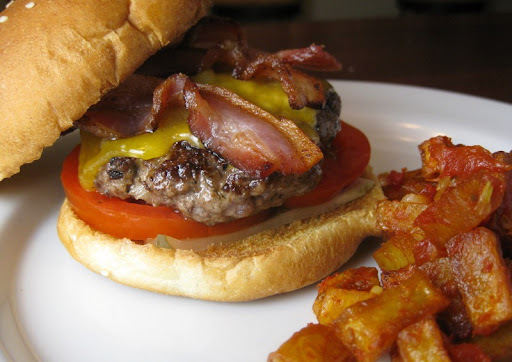 It is lighter on the sugar than some recipes (we prefer our bacon more salty than sweet). The heat from the jalapeños is definitely present, but subtle. This bacon works best if the belly is somewhat fatty rather than lean. Mix together the salt, sugar and pink salt. Sprinkle generously over all sides of the belly, then gently shake off the excess. Place the belly into a non-reactive dish or zip lock bag. Blitz the jalapeno with the pickling liquid in a food processor or blender. In a bowl, stir the garlic, bay leaves and peppercorns into the jalapeño, then add to the belly being sure to coat all sides fairly evenly. 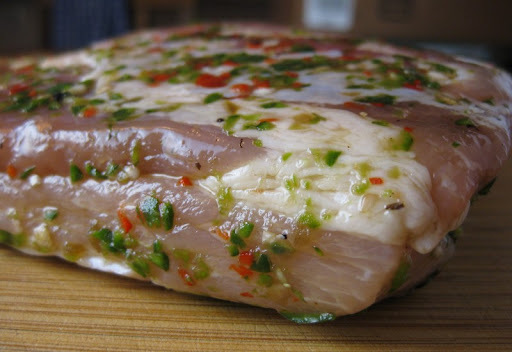 Let cure in the refrigerator 5 to 8 days, turning the belly every other day. The meat is ready once it is reasonably firm when pressed. Remove the belly and rinse off the cure with cool water. 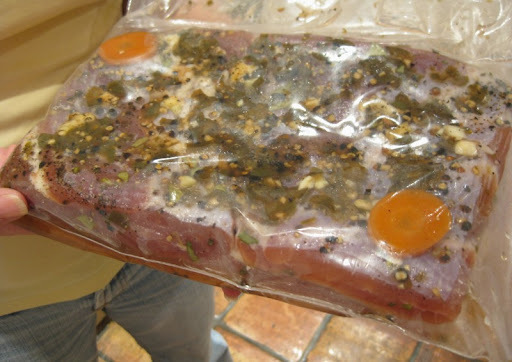 Pat dry, place on an oiled rack and return to the refrigerator to dry uncovered, overnight. Smoke at 150-180 degrees using apple and oak. The bacon is ready once it reaches 150 degrees - usually in about 3 hours.